Full front button down with white pearlized buttons. 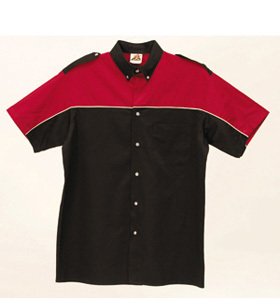 60/40 cotton and polyester twillButton down, banded collar. Hemmed open sleeves. Button down shoulder epaulets. Coordinating piping trim on chest, sleeves and back "V" panel. Even finished bottom hem for in or out wear. Fit: Full cut. Right chest pocket. All shirts sold BLANK, without logos shown. Colors: red, royal, gold, green, orange and purple.